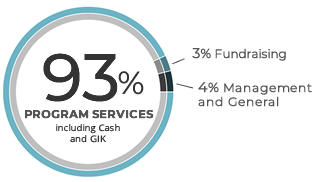 In FY2018, 93% of our expenditures went to Program Services. Feed the Children is a 501(c)(3) non-profit organization; contributions are tax deductible as allowed by law. Each donated dollar helps provide seven dollars worth of food, essentials, and more to hungry children and families here in the U.S. and around the world. Give hope, dignity and comfort to those who desperately need help in the U.S. and around the world. Each dollar you donate provides $7 worth of food and essentials to children and families. If you have not already registered, you will receive periodic email updates from Feed the Children. You can unsubscribe at any time from any email. Feed the Children is a 501(c)(3) non-profit organization. Donations and contributions are tax-deductible as allowed by law. Feed the Children's Tax Identification number is 73-6108657.